You’ll spend hours ensconced on your sofa binge-watching these hefty boxed sets! t With “Royals” being all the rage (just ask recent Grammy winner Lorde), timing could not be better for the upcoming releases of HBO’s Game of Thrones season 3, the Starz original miniseries The White Queen on Blu-ray and the fab fashion featurettes on both offerings. t HBO’s Game of Thrones is a treasure-trove of treachery, skulduggery, dragons, sword fights, silks, satins and armor of precious metal. (Did you know the show’s embroidery empress Michele Carragher has her own blog?) 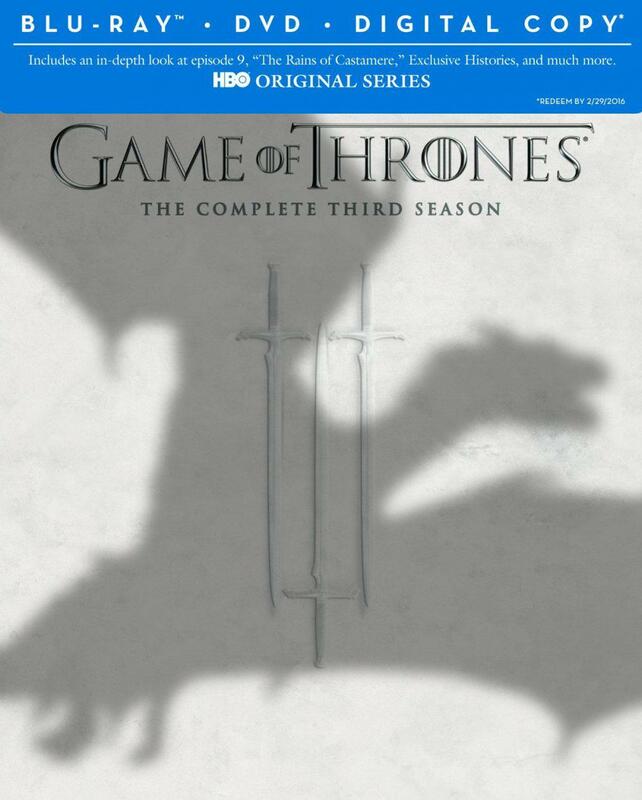 No spoilers here, but surely anyone who knows the show, or is even a casual fan has heard of the infamous “Red Wedding” zinger in season 3.
t Season 3 is truly one of the best, and seeing it in all its gory glory on Blu-ray is a special treat. Here we catch up with the Lannisters as they are barely holding on to power after a series of savage onslaughts. Across the Narrow Sea, the ethereal blonde princess Daenerys Targaryen, reunited with her three precious dragons, attempts to raise an army in hopes of claiming the Iron Throne. t In addition to an inside look at the amazing and elaborate wardrobes on the show, there are dozens of featurettes (12 audio commentaries, for starters) and recaps of the previous seasons to get you up to speed for the inevitable hours you’ll spend ensconced on your sofa binge-watching this hefty boxed set! t Once you’ve enjoyed season 3 of Game of Thrones, you can head from the “Red Wedding” to The White Queen. t Based on Philippa Gregory’s series of best-selling novels (Gregory also wrote The Other Boleyn Girl), and set against the backdrop of England’s Wars of the Roses during the 15th century, The White Queen revolves around women caught up in the struggle for the royal throne. They are Elizabeth Woodville, Margaret Beaufort and Anne Neville. Unlike The Tudors, which provided more of a male viewpoint on the world and politics, it’s women who shape the story over the course of 10 episodes. I was riveted by their individual and collective quests for power as they schemed, seduced and manipulated behind the scenes of history using all their feminine wiles (while dressed to the nines!). t Special features on the Blu-ray include The Making of The White Queen, Series Overview, Book To Series, The History Behind The White Queen, The White Queen: Set Tour, Woman In A Man’s World and Dressing The Queen: a Look at the Wardrobe.